Here are some ways you can prepare for large and small emergencies. You can receive emergency alerts on any text-based device in Burlingame and other cities in San Mateo County by signing up at smcalert.info. It’s free. Visit these websites for helpful tips on preparing yourself and your family for emergencies. Remember to make an emergency plan and assemble an emergency kit for your workplace, too. Here are other tips for businesses from Ready.gov. Attend BNN meetings to build a sense of community, become informed about emergency and disaster preparedness, and support one another during emergencies and disasters. BNN offers free quarterly programs, helps new groups get started and invites participation in the annual Citywide Emergency Drill. Subscribe to BNN’s free newsletter. Get help in forming a Neighborhood Network. BNN can assign a mentor to walk you through the process, furnish sample handouts and come to your first neighborhood meeting. 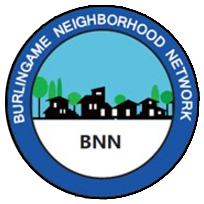 Contact BNN at info@burlingamenetwork.org. Find out about training classes you can take to prepare yourself and your family for large and small emergencies. Learn more. At Burlingame’s annual exercise, you’ll learn what to do in the immediate aftermath of a major disaster, when emergency responders advise us we’ll be on our own for three days or longer. Learn more.